The United Kingdom has one of the highest potentials in the world for energy generated by the wind. After a series of enacted governmental policies regarding energy, a shift towards renewable forms was made. The North Hoyle Offshore Wind Farm was one of the first projects constructed after this shift occurred. The project, owned in partnership by Npower Renewables and Green Peace, had a total construction cost of £80 million. The site is located about 7-8 km off the coast of North Wales and spans 10 km2 (RWE Innogy n.d.). It sits in Liverpool Bay between the towns of Rhyl and Prestatyn. The site was chosen for its relatively shallow waters and high wind speeds. There are 30 V80 turbines at the site, each capable of producing 2 MW for a name plate capacity of 60 MW (MHI Vestas Offshore Wind n.d.). The turbines stand 110 m tall with a rotor diameter of 80 m (Webgiorgio 2007). Subsea cables connect the turbines to the shore at a substation in Rhyl where the generated electricity is transferred to the national electricity grid (RWE Innogy n.d.). In the first year following the construction of the North Hoyle wind farm, data was continuously collected by several groups in order to track the impact of the project. Npower reported findings regarding the efficiency of the turbines. During the first year, the total output of 188,135 MWh was less than the expected 194,886 MWh (npower Renewables Limited n.d.). The average wind speed of 8.7 m/s was similarly lower than the expected 9.0 m/s, which is likely to have contributed to the lower output (npower Renewables Limited n.d.). In addition to the technical measurements reported by the annual study, environmental data was also collected. This data showed that the fish and bird species of the area appeared in relatively low numbers both before and after construction. Any changes noticed were not substantial and, therefore, it was concluded that the wind farm had no adverse impact on the environment. Despite the small shortcomings in the total output, the site is effectively supplying clean energy to the citizens of the UK while also encouraging the creation of more projects similar to it. It powers about 40,000 homes per year and will prevent the release of over 160,000 tons of carbon dioxide over the course of the 20 years it was designed to operate (Webgiorgio 2007). This is extremely important since carbon dioxide is one of the major greenhouse gasses leading to climate change and ocean acidification. The UK has been dedicated to reducing carbon emissions and shifting towards renewable energy was a key step in doing so. In offshore wind power alone, the UK has installed as much capacity as the rest of the world combined (Energy UK 2015). North Hoyle has been equally beneficial to the economy of the UK as it has been for the environment. Vestas alone permanently employs over 900 workers at the North Hoyle site, not to mention those employed by the 30+ other companies involved in the maintenance and operation of the site (Webgiorgio 2007). Overall, North Hoyle is a successful model to be studied and learned from in order to continue the necessary shift towards renewable energy. Energy UK. 2015. Renewable generation. http://www.energy-uk.org.uk/energy-industry/renewable-generation.html. MHI Vestas Offshore Wind. n.d. North Hoyle UK. http://www.mhivestasoffshore.com/north-hoyle/. npower Renewables Limited. n.d. “Capital Grant Scheme Annual Report July 2004 – June 2005.” http://www.wind-power-program.com/Library/Performance%20of%20large%20scale%20wind%20farms/DTI%20Report%20on%20North%20Hoyle%20Offshore%20Wind%20Farm.pdf. RWE Innogy. n.d. North Hoyle. 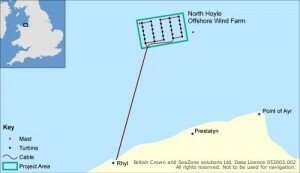 http://www.rwe.com/web/cms/en/311610/rwe-innogy/sites/wind-offshore/in-operation/north-hoyle/. Webgiorgio. 2007. Youtube: Vestas build offshore wind farm “North Hoyle”. April 12. https://www.youtube.com/watch?v=1_uezuWLpPU.